64거 1267 Normal series since 2004. 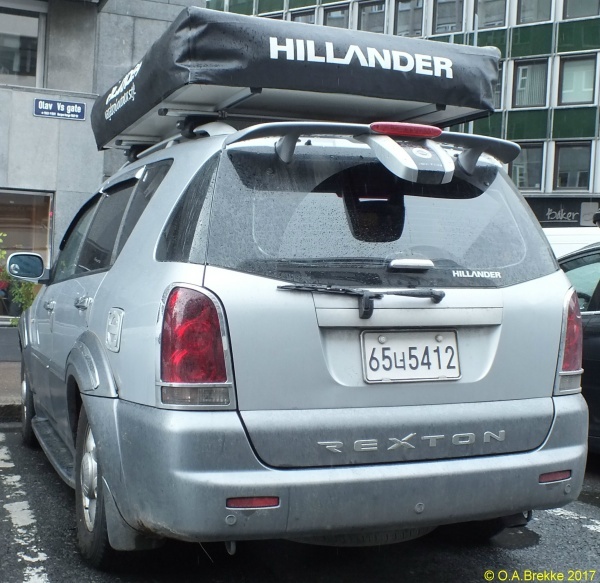 2007 onwards plate style. European size. 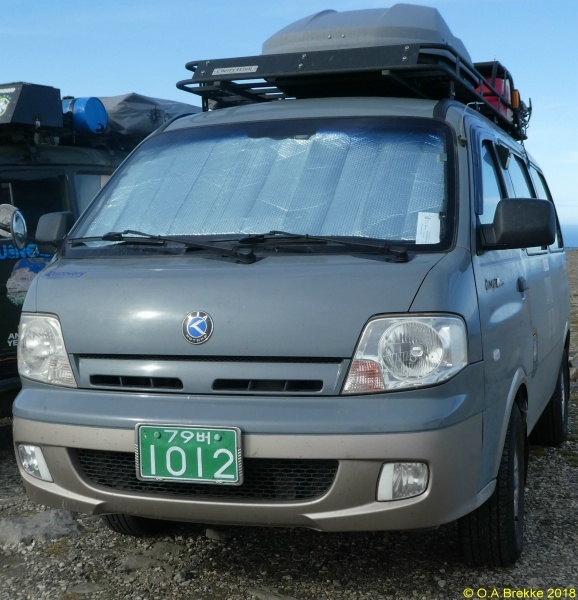 01-69 = Passenger vehicles for up to 10 people. 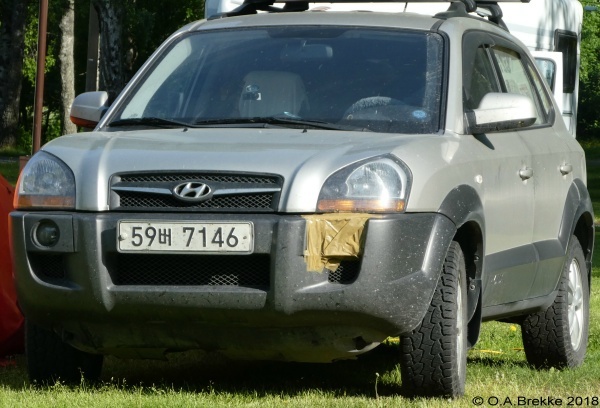 With a translated plate underneath. 64거 1267 Close-up of the above. 64 GEO 1267 Close-up of the translated plate. 59ㅂㅓ 7146 Normal series since 2004. 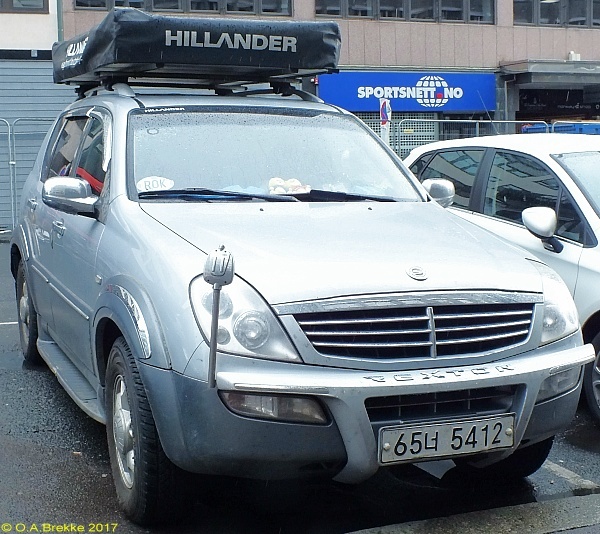 2007 onwards plate style. European size. 01-69 = Passenger vehicles for up to 10 people. 59ㅂㅓ 7146 Close-up of the above. 59 BEO 7146 Normal series since 2004. 2007 onwards plate style. European size. 01-69 = Passenger vehicles for up to 10 people. With the Korean letters translated to Western letters. 59 BEO 7146 Close-up of the above. 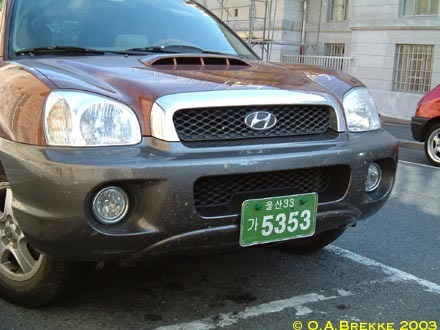 65너 5412 Normal series since 2004. 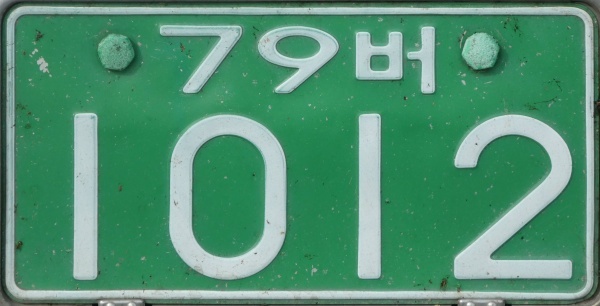 2007 onwards plate style. European size. 01-69 = Passenger vehicles for up to 10 people. 65너 5412 Close-up of the above. 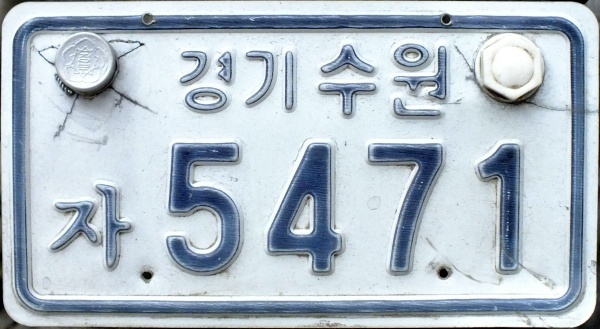 65너5412 Normal series since 2004. 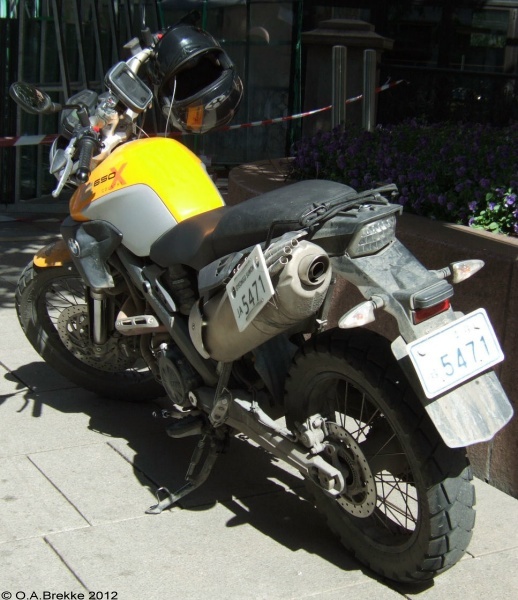 2007 onwards plate style. Japanese size. 01-69 = Passenger vehicles for up to 10 people. 65너5412 Close-up of the above. 경기 수원 / ㅈㅏ 5471 Motorcycle series. 경기 = Gyeonggi. 수원 = Suwon. The lower line is serial. 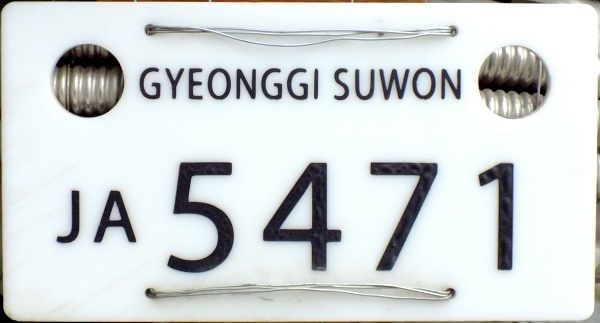 Transcribed into Latin characters the plate reads Gyeonggi Suwon JA 5471, as seen on the translated plate on the side of the motorcycle. 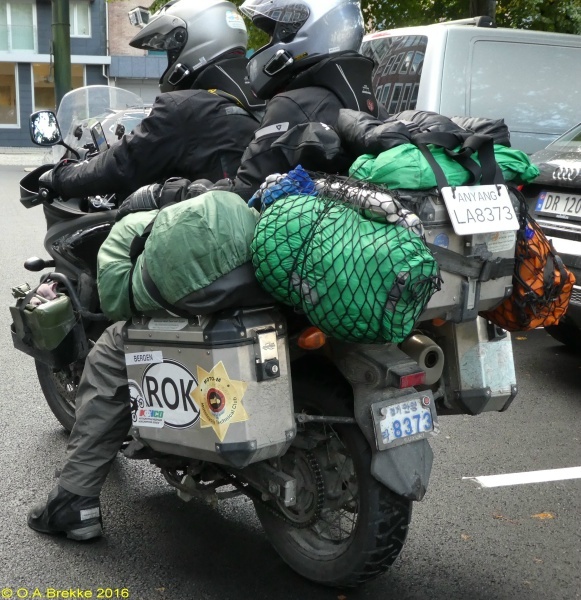 경기 수원 / ㅈㅏ 5471 The above showing an ROK oval of sorts on the side of the motorcycle. 경기 수원 / ㅈㅏ 5471 Close-up of the above. JA 5471 Close-up of the translated plate on the side of the motorcycle. 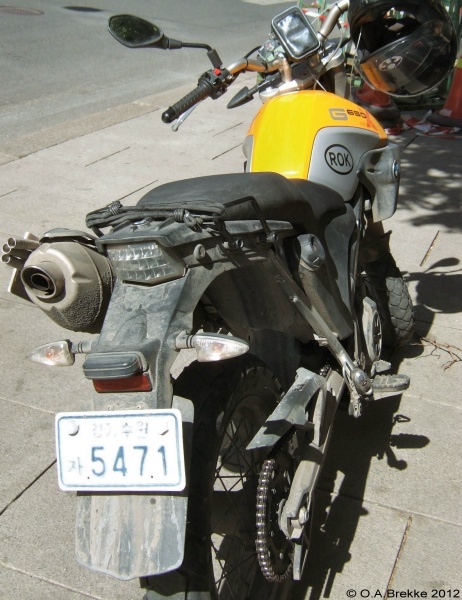 경기 안양 / ㄹㅏ 8373 Motorcycle series. 경기 = Gyeonggi. 안양 = Anyang. The lower line is serial. 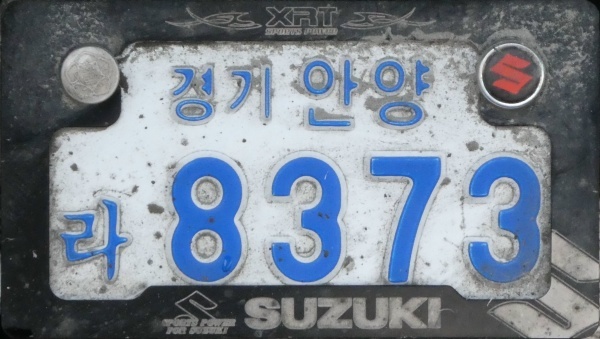 Transcribed into Latin characters the plate reads Gyeonggi Anyang LA 8373, as seen on the translated plate (with Gyeonggi omitted). 경기 안양 / ㄹㅏ 8373 Close-up of the above. LA 8373 Close-up of the translated plate. 올산33 / 가 5353 Normal series 1995-2004. 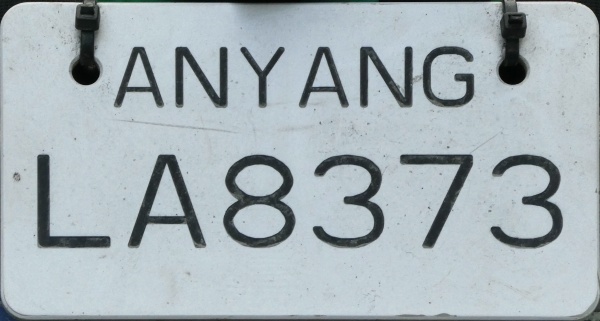 1995-2004 plate style. This plate is a flat plastic remake. 올산 and 33 = Ulsan. The lower line is serial. 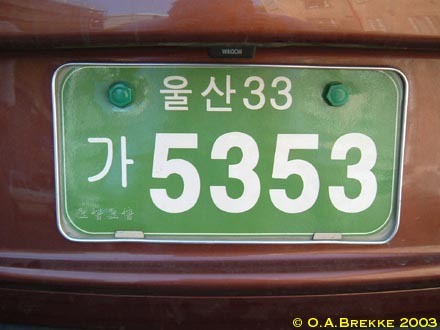 Transcribed into Latin characters the plate reads Ulsan 33 GA 5353. White on green plates were used for cars, some trucks and private buses. At lower left 5353 is repeated spelled out in words (since 1997). 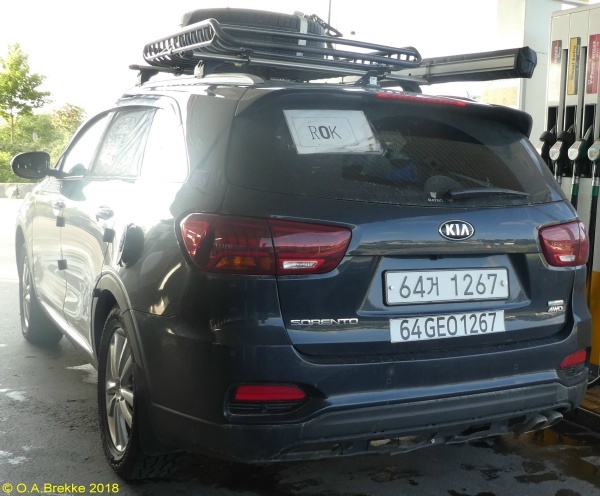 Thanks to Andy Lachs for help in decoding this plate. 올산33 / 가 5353 Close-up of the above. 79 ㅂㅓ / 1012 Normal series since 2004. 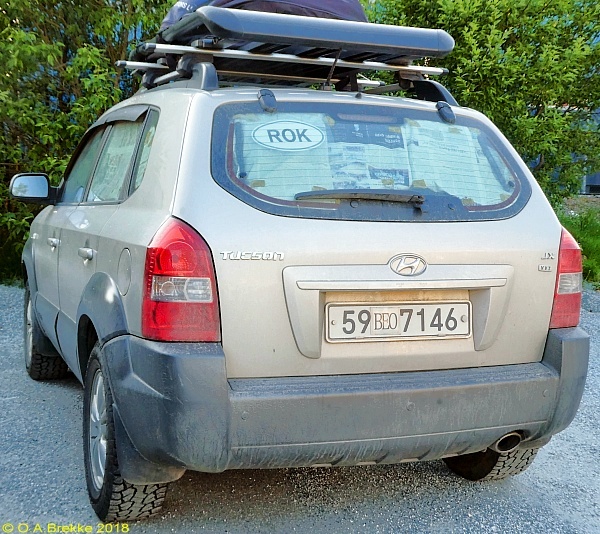 2004-07 plate style. 70-79 = Passenger vehicles for over 10 people. White on green plates were used for cars, some trucks and private buses. 79 ㅂㅓ / 1012 Close-up of the above.